Kids are already a pretty fantastic workout since they require constant attention, but if you find your fitness routine hindered by having to deal with a cumbersome pram, you'll probably be intrigued by the KidRunner. It's a new take on the pram that's pulled instead of pushed, letting you easily bring your kids along for a run or a jog by strapping a mini trailer to your belt. It's designed to accommodate kids from six months to four or five years old, or up to 20 kilos. The KidRunner connects to a cushioned belt on a runner leaving their arms free to naturally move while run running. 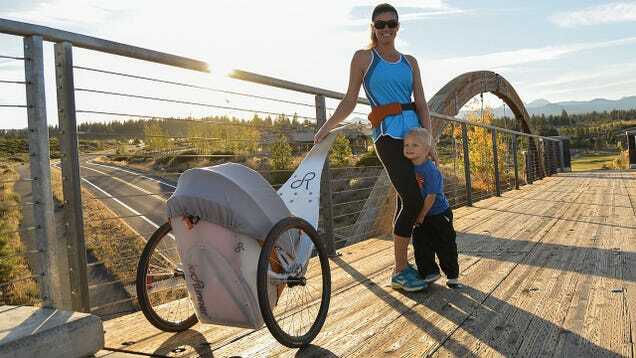 Between the belt and the actual pram that rolls along with a pair of bicycle wheels is a flexible bow that dampens the up and down motion of a runner so that a kid in tow isn't being constantly bounced around. Because kids and motion sickness go hand in hand. Made from lightweight composite materials, the aim is a pram alternative that weighs no more than nine kilos and collapses into a backpack for easy transportation and storage. Unfortunately, if the KidRunner seems like the perfect pram for you, you'll have to wait a little longer to get one. It's not expected to be available until later this year.